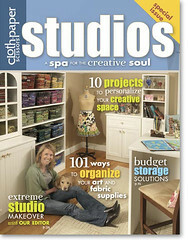 The special edition Studios issue of Cloth Paper Scissors should be on the newstand April 1. It includes my project instructions for a 12-pocket colored pencil roll. I know the pre-orders hit mailboxes this week because I’ve already received some very lovely e-mails. Thank you! A HUGE thanks to Kelly of Whatever is Lovely and Michelle of greetingarts for testing the pattern with zipped lips, in the dark of night, under time pressured conditions. You gals are fab! The photography is gorgeous, the whole issue a treasure. A peek at 21 different studios and 9 different hands-on projects are included. A book for the price of a magazine. Seeing so many working studios with creative solutions to common problems is extremely inspiring. I say ‘working studios’ because the artists are in their spaces creating in square footage from tiny to really big (yes Pam, I’m totally drooling over all that space!) and it’s all real, not staged to death. It gives me hope that I too can one day be organized! 4/1/08 Marianne requested a link for purchasing online.